Analysis: Davis will end the year where he left off, as the third-year receiver played in two games before aggravating a hamstring injury that forced him to miss the first nine games of the regular season. Jake Kumerow (shoulder) will take his spot on the roster and is expected to see some opportunities at kick returner. Analysis: This statement comes straight from coach Mike McCarthy. Davis was forced out of Sunday's game with this hamstring injury, and it is seemingly serious enough to again keep him off the field. Tramon Williams or Marquez Valdez-Scantling could take over special teams duties, particularly on kick and punt returns. Davis' injury may also leave room for fellow wide receiver Jake Kumerow (shoulder) to return to the team after standing out -- and getting injured -- in preseason. Analysis: Davis spent the first half of the season on IR due to a hamstring injury and this most recent setback came in just his second game since returning. He had been handling kick and punt returns and operating as a gunner on punts as well. 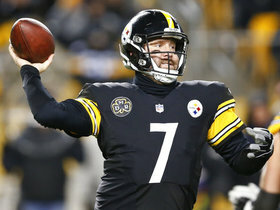 The severity of his injury is unknown, and he should be considered questionable for next week's game against the Cardinals for the time being. Look for Tramon Williams or Marquez Valdes-Scantling to handle the return duties if Davis is held out. Analysis: This isn't good news for Davis, who spent the first nine games of the season on injured reserve with a hamstring injury. In his absence, the Packers will likely use Tramon Williams and Marquez Valdes-Scantling to handle return responsibilities. Analysis: Davis has already spent the mandatory eight weeks on injured reserve and appears fully healthy, so he'll be eligible to suit up against the Seahawks in Week 11. The third-year wideout will serve as Green Bay's primarty kick returner, but he's unlikely to see a significant role outside of special teams. Coach Mike McCarthy said Wednesday that Davis (hamstring) will be one of the two players the team designates to return from injured reserve, Ryan Wood of the Green Bay Press-Gazette reports. Head coach Mike McCarthy does not expect Davis (hamstring) to practice this week, Josh Tolentino of The Athletic reports. Analysis: Davis, who's eligible to return to practice this week for the first time, is considered one of Green Bay's most likely candidates to be activated off IR this season. However, it doesn't seem as if the return specialist is particularly close to being ready for game action, which presumably keeps the door open for Ty Montgomery to continue handling kickoff returns while Tramon Williams takes care of punts. Davis (hamstring) can practice for the first time next week, which would open a two-week window to activate him from injured reserve, Jim Owczarski of the Milwaukee Journal Sentinel reports. 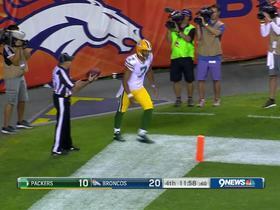 The Packers placed Davis (hamstring) on injured reserve Tuesday, Adam Schefter of ESPN reports. Davis is inactive for Sunday's season opener against the Bears due to a hamstring injury, Rob Demovsky of ESPN.com reports. Analysis: It's unclear whether Davis' current injury is related to the hamstring issue, which derailed him for months during the offseason. Expected to have served as Green Bay's top kick returner, Davis will need to return to health soon to hold on to his spot on the 53-man roster. Davis (coach's decision) is inactive for Sunday's season-opening game against the Bears, Josh Tolentino of The Athletic reports. Analysis: Davis managed to earn a spot on Green Bay's 53-man roster, but will not suit up for Week 1. In Davis' place, Ty Montgomery and Jaire Alexander stand to share kick return duties. Davis totaled 160 yards on seven kick returns and minus-four yards on his only punt return during Thursday's preseason finale against the Chiefs. Analysis: The Packers clearly gave Davis plenty of opportunities to prove himself as a special-teams asset -- which is Davis' only ticket to a spot on the 53-man roster ahead of Saturday's cutdowns. While Davis came close to breaking one loose on a kick return, he also fumbled on a different attempt and had a so-so night overall. It will be interesting to see if Green Bay opts to keep him in favor of one of their three draft picks at receiver. 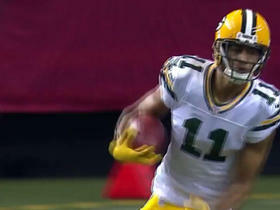 Davis returned to practice Monday, Ryan Wood of the Green Bay Press-Gazette reports. Analysis: Davis immediately began working as a kick returner, with no Packers player emerging in the return game in the 2016 fifth-rounder's absence. Though Davis is not a lock to make the 53-man roster, his success as a return man last season (12.0 yards per punt return) could help the 25-year-old's case. Davis has not yet seen any preseason action, and his last chance to suit up before Week 1 will be this Thursday against Kansas City. Davis (hamstring) did not play in Thursday's preseason game against the Steelers. Analysis: Davis has not played in either of the Packers' exhibition games thus far, and he is not a sure bet to make the cut. The best thing going for him is no one has emerged in the return game in his absence, and he has a track record of success there after averaging 12.0 yards per punt return a year ago. Davis (hamstring) did not play in Thursday's preseason opener. Analysis: Davis has dealt with a hamstring injury for a few months now, and the setback is preventing him from taking part in game action. That's an unfortunate development for Davis, who is facing strong competition for his roster spot from several young receivers. Davis (hamstring) did not participate in Saturday's practice, Michael Cohen of The Athletic reports. Analysis: Davis returned to training camp Thursday after dealing with a hamstring injury in May and June, so Saturday's absence may have simply been a scheduled day of rest as the Packers ease their return man back into action. Davis will have a chance to climb the depth chart at wide receiver following the departure of Jordy Nelson, while Geronimo Allison and J'Mon Moore present competition behind Davante Adams and Randall Cobb. Davis (hamstring) was practicing at Packers' training camp Thursday, Wes Hodkiewicz of the Packers' official site reports. Analysis: Davis was sidelined by the hamstring issue in May and June, but he appears no worse for wear as Packers training camp kicks into gear. 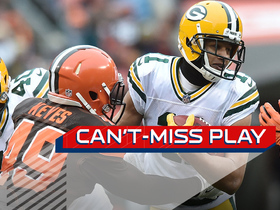 Davante Adams and Randall Cobb are locked in as Green Bay's top two wide receivers, but a strong camp could could help Davis earn a larger role than previous seasons following the departure of Jordy Nelson. Davis did not participate in minicamp Tuesday due to a hamstring injury, Ryan Wood of the Green Bay Press-Gazette reports. Analysis: Davis was sidelined for the start of OTAs a few weeks back after suffering a hamstring injury, but he was ultimately able to return to the field last week. Whether this is an aggravation is yet to be determined, but either way, it's likely the Packers are proceeding with caution, as the injury never was considered serious from the start. Davis (hamstring) participated in OTAs on Monday, Rob Demovsky of ESPN.com reports. Analysis: Davis' return for the second week of OTAs alleviates any concerns surrounding his hamstring injury, and the wideout's absence was likely just precautionary this early in the offseason. Davis is once again expected to be used primarily on special teams this season as a punt and kick returner in Green Bay. Davis is battling a hamstring injury at the beginning of OTAs, Rob Demovsky of ESPN.com reports. Analysis: Davis' issue will be more concerning if it creeps into minicamp and training camp, but the team is likely taking precautions early in the offseason to avoid further injury. The third-year wideout figures to mainly factor in as a returner for the Packers in 2018, but an influx of rookies during the 2017 NFL draft may force him to fight for a 53-man spot. Charges won't be filed against Davis after he was arrested April 8 for making "criminal threats" at Los Angeles International Airport, Rob Demovsky of ESPN.com reports. Analysis: According to airport police, Davis was taken into custody after making an ill-advised joke about having a bomb at LAX. Davis appeared at an informal hearing with the Los Angeles City Attorney last week to relay his side of the story, with the city subsequently dropping the charges levied against the 24-year-old wideout. The legal issue didn't result in Davis missing any activities during the Packers' offseason program. The Packers released a statement acknowledging that they are aware of the situation involving Davis, who recently was arrested for making criminal threats at Los Angeles International Airport, Rob Demovsky of ESPN.com reports. 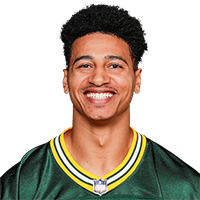 Davis had three receptions for 56 yards in the Packers' Week 17 loss to the Lions and finished the season with five receptions for 70 yards. Davis had one carry for four yards in Sunday's 31-28 loss to the Steelers. Analysis: Davis' carry was his first touch on offense since he had both a carry and a reception against the Lions in Week 9. He is working as the Packers' primary return man for both punts and kicks, and he's likely to continue playing a bit role at best on offense. Davis had one rush for nine yards, one reception for five yards and racked up 140 yards on kick return Monday against the Lions. 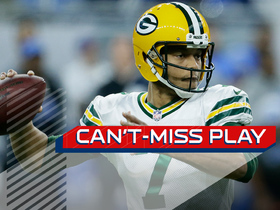 Analysis: It was noticeable that head coach Mike McCarthy was trying to mix things up on the offense, and Davis was deployed on the first drive. Still, he's mainly summoned to return punts and kicks. The No. 5 Packers' wideout logged just six offensive snaps Monday, though, so the second-year pro shouldn't be considered a viable fantasy asset at this time. The "Good Morning Football" crew reveals the NFL Players of the Week for Week 14. 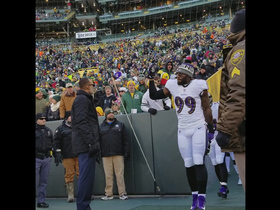 The Baltimore Ravens run out to boos at Lambeau field before their Week 11 matchup against the Green Bay Packers. 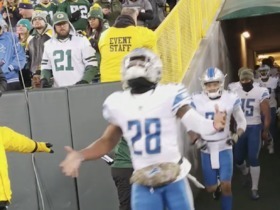 The Detriot Lions run out to boos at Lambeau Field before their Monday Night Football matchup against the Green Bay Packers. 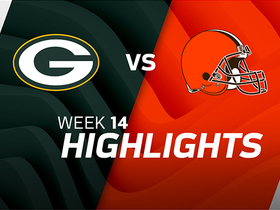 Watch Green Bay Packers highlights from the 2017 preseason. 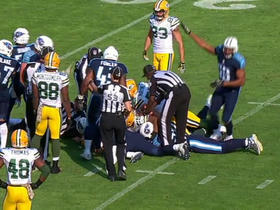 Green Bay Packers wide receiver Trevor Davis muffs catch on punt, Tennessee Titans recover.